The Black-billed Amazon's (Amazona agilis) population may decline over 50% in the next few decades. Project progress: In collaboration with the American Bird Conservancy and the Kyle Brown Legacy WPT provided funding to study the distribution and population size of Jamaica's Amazon parrots, including the Black-billed Amazon, in Cockpit County. Outcomes: Since 1995, there have been studies to determine the species' range, estimate population size, identify factors limiting reproduction and train local people in research methods and monitoring (Davis 1997, BirdLife Jamaica in litt. 1998). Some of its habitat has been designated a park but protection of those areas has been lacking (BirdLife Jamaica in litt. 1998). 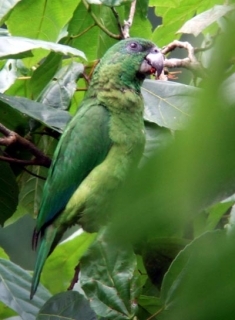 There is also an ongoing effort to prevent bauxite mining in Cockpit Country and discussions have begun which may lead to the halt of parrot importation into Jamaica to lower the risk of escapes and interbreeding (S. Koenig in litt. 2007, 2009). Ecology: This species is found between 300-1200m (984-3936 ft) in wet limestone forest; also found in agricultural plots in forest and cultivated areas at forest edge. It feeds on seeds, fruits, berries, leaf buds and blossoms, also ripe plantain Musa, Cecropia, Ficus, Nectandra, Bryophyllum, Blighia sapida and Melia azedarach. Birds are found in flocks of 6-40 individuals or more. They roost communally, rising at sunrise with much noise and high-flying, feeding in middle to upper storeys of canopy. Birds wander locally according to food availability.